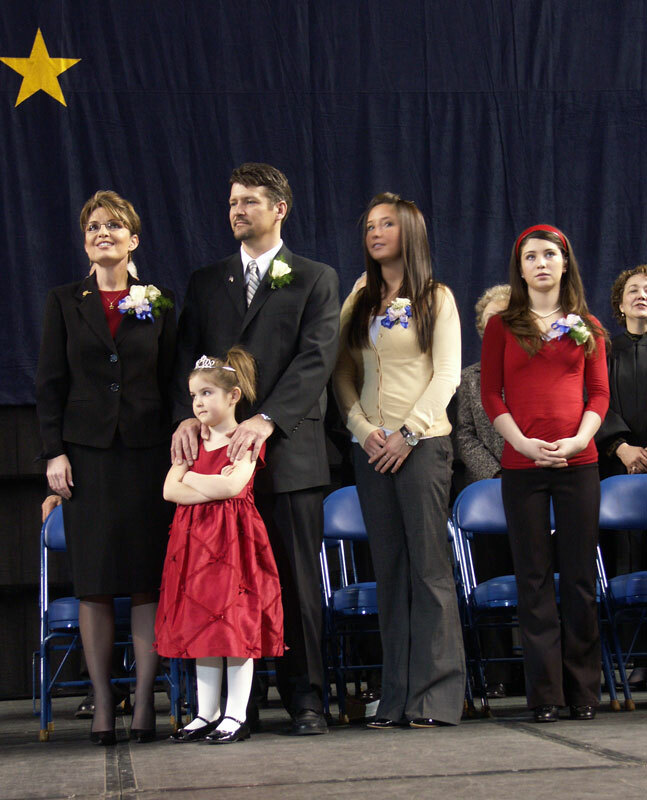 On Alaska’s dime, the Palin kids get to travel the country on official business! I just read this AP investigation about how Governor Palin has stuck it to the Alaskan people with her highfalutin traveling with her kids in tow. Looks like she’s been giving former California Speaker of the Assembly Fabian Nuñez a run for the money with the lavish travel expenses. While Nuñez dipped into his campaign kitty to pay for his travel expenses, Governor Palin passes the bill to her fellow Alaskans. “The charges included costs for hotel and commercial flights for three daughters to join Palin to watch their father in a snowmobile race, and a trip to New York, where the governor attended a five-hour conference and stayed with 17-year-old Bristol for five days and four nights in a luxury hotel. In all, Palin has charged the state $21,012 for her three daughters’ 64 one-way and 12 round-trip commercial flights since she took office in December 2006. In some other cases, she has charged the state for hotel rooms for the girls. These travel records reveal the bigger question in my mind: Why weren’t these girls in school? Governor Palin is trying to amend official expense reports to suggest that the girls were on official state business. Who is she kidding? Sarah Palin’s travel advisor must be Fabian Nunez. Or maybe this entitlement mentality that reeks throughout her public behavior is all related to her religious convictions. Then again, there’s always the chance she has no concept of money. Where it comes from, how it is earned, and its relationship to inflationary and market prices. Or maybe she’s so depressed Mervyns is going out of business, she’s charging the state of Alaska for everything. That sounds more in line regarding advice from Fabian Nunez. I would venture to guess that any travel expenses and lodging by Obamas kids and wife are picked up by U.S. tax payers. I would also point out that Obama has three time more secret service agent protecting him than McCain does and once again it is tax payers footing the extra expense. If you’re wearing blinders there is a good chance you will walk face first into a wall when you make that hard left. I’m sure Obamas family is pampered to on a much higher scale than Palins. I am sure if that was the case, FOX News, Bill O’Reilly, and Rush Limbaugh would have been all over this a long time ago. This waste of public money has more of an elitist attitude than anything Obama has done. The fact that FOX News, Bill O’Reilly, and Rush Limbaugh have focused all their energies on telling listeners Obama is really a Muslim, has relations with terrorists, and is too skinny to be President tells you how concerned they all are with reporting anything truthful. But it seems that suits you just fine doesn’t it? Especially since your interests are not exactly colorblind. When Obama travels with his wife and kids, the expense is charged to his campaign, which is different from charging the tax payers of his state or even the fed govt (also remember that Obama has not taken public campaign financing). Futhermore, you don’t see the Obama children out on the road at all of these rallies and events continuously because their grandmother cares for them in Chicago when both parents are on the road. I would guess that Obama’s kids are at home more than they are on the campaign trail. Stop trying to make excuses for Sarah “one of us” Palin. I doubt that you have traveled the country with your children and then billed your employer for the cost, or maybe you have? Oh, I get it now. Obamas family travels on part of the 63 million dollars contributed by every day U.S. citizens to his campaign. Now if you do the math there is no way that citizens could have possibly contributed that much money. So, I ask where did all that cash come from? You’re probibly wanting me to answer that, but you know as well as I do that a large portion of those contributions came from other countries trying to sway the outcome of this election. The endorsement by Colin Powell can now be added to the same list as the endorsement of Obama by Hamas and others from that part of the world. Why would they be wanting so badly to put Obama in the White House? Damn, I slipped up and told you where a lot of that money came from. Thank God, you won’t be advising or creating public policy for the next four years. We’ve had enough of Jim Crow and all its continuous reminders. Does it bother you so much, that a man of color will be representing your interests to the world? Do you feel that superior intellectually, physically and spiritually, that you can’t image a world without a WASP in charge. Well…all that segregation now and segregation forever is passé. It’ll be a new world come January 2009. It will be a new world that you will no longer recognize as America and that is exactly what is about to happen IF Obama is elected. He is not too black to be President, he is too green. He’s a media created puppet being controlled by some very powerful people who have yet to be identified. Follow all the other sheeple that are so in awe of Obama and you will some day regret what has happened to this country because of his socialist politics. Please read and understand that Obama is not who he pretends to be. hard and there were lots of student loans. he used all his life) during this time had two roommates, Muhammad Hasan Chandoo and Wahid Hamid, both from Pakistan . University in New York . It is at this time he wants everyone to call him Barack – not Barry. Do you know what the tuition is at Columbia ? It’s not cheap! to say the least. Where did he get money for tuition? Student Loans? Maybe. After Columbia , he went to Chicago to work as a Community Organizer for $12,000. a year. Why Chicago ? Why not New York ? He was already living in New York . money’ for his U.S. Senate race. In 2005, Obama purchased a new home in Kenwoood District of Chicago for $1.65 million (less than asking price). With ALL those Student Loans – Where did he get the money for the property? was purchased. Obama met Nadhmi Auchi many times withRezko. this? Shiraz , Iran ! Do we see a pattern here? Or am I going crazy? buried in the back part of the papers, Iraqi newspapers reported that during Obama’s visit to Iraq, he asked their leaders to do nothing about the war until after he is elected, and he will ‘Take care of things’. Oh, and by the way, remember the college roommates that where born in Pakistan ? They are in charge of all those ‘small’ Internet campaign contribution for Obama. Where is that money coming from? The poor and middle class in this country? Or could it be from the Middle East ? And the final bit of news. On September 7, 2008, The Washington Times posted a verbal slip that was made on ‘This Week’ with George Stephanapoulos. Obama on talking about his religion said, ‘My Muslim faith’. When questioned, ‘he make a mistake’. Some mistake! Pakistan in 1981; The Washington Times – September 7, 2008; The Times May 10, 2008. Now the BIG question – If I found out all this information on my own, Why haven’t all of our ‘intelligent’ members of the press been reporting this? A phrase that keeps ringing in my ear – ‘Beware of the enemy from within’!! This was investigated and posted by a citizen that has seen through this fraud Obama and we only hope that millions of other proud Americans do the same before election day. After that, it may be too late to prevent the Socialist Republic of _______. Who really knows who Obama is? Alright now. I’m surprised she’s not using the money to shop for shoes in Russia, since I’m sure she can see the sales from across the water in Alaska. Secret Service are all dupes of the left. I am sure these two agencies have well investigated Obama by now, AND if what you submit is true which it is not wouldn’t they have alerted us? They are after all supposed to protect us from all enemies foriegn or domestic. Yes you can go to Columbia and Harvard on student loans as many of my friends have. I went to college and graduate school on loans and a GI Bill. My two kids have utilized loans to get through college and graduate school. I have also traveled a lot of the world on the very cheap as have many of my students. Well if the people of Alaska are willing to foot the bill, who cares. There a Republican state… How smart can the people of that state be anyway? Many politicians travel with their families at tax payer expense. Governors, senators, congresspersons all do it. This is why not one has addressed this issue, if it is an issue. BTW. Barack Obama went to Hawaii to see grandma at the expense of his campaign.